Headquarter of GFL Environmental in Toronto with Wilkhahn seating. It’s impossible to imagine a more harmonious way of integrating corporate identity into a design concept than at the new headquarters of the Canadian waste disposal company GFL Environmental (Green for Life) in Toronto. 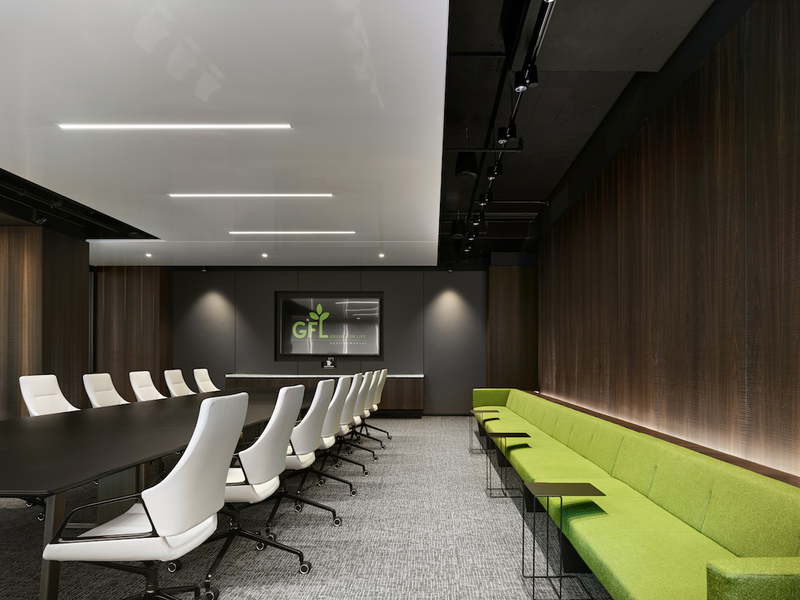 Here, Gensler Architects created an interior that focuses on high-quality natural materials and colours that contrast in places with the fresh green GFL corporate colour. 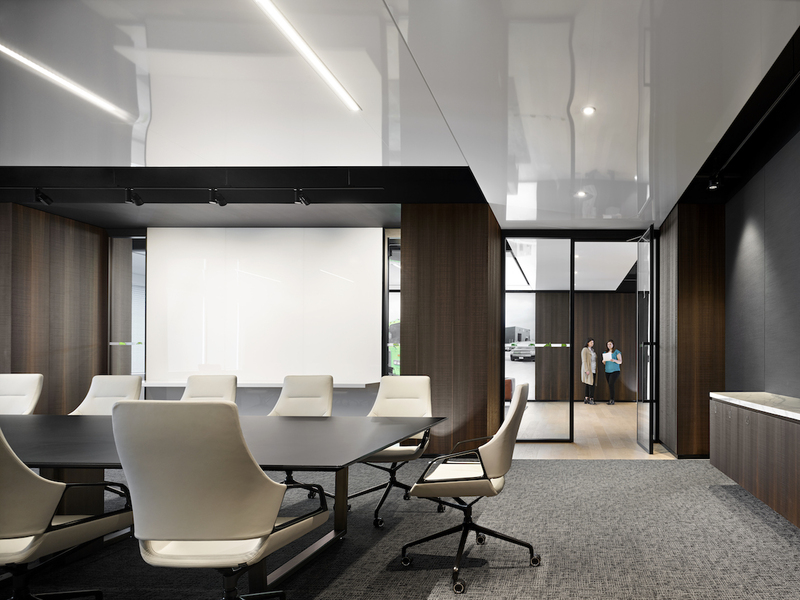 The architects picked an atmosphere defined by sedate American walnut for the entrance areas, lobbies and conference rooms, while offices for the organisation’s employees stick to light white and grey hues. They chose Wilkhahn’s stylish Graph conference chairs (design: jehs+laub) in light-coloured upholstery for the conference spaces. On the other hand, crisp-looking Neos cantilever chairs covered in the corporate colour are placed at conference tables in the offices. Wilkhahn’s three-dimensional ON free-to-move office chair (design: wiege) is the standard seating at desks. GFL Environmental ist ein stetig wachsendes Unternehmen auf dem Gebiet der Umweltdienstleistungen. Im Jahr 2007 vom kanadischen Unternehmer Patrick Dovigi gegründet, beschäftigt es inzwischen über 5.000 Mitarbeiter. Die Firma bietet Dienstleistungen auf kommunaler Ebene für heute über zweieinhalb Millionen Haushalte ebenso wie für rund 80.000 Industriekunden an. In Nordamerika ist das für seine coolen hellgrünen Trucks im Stadtraum bekannte Unternehmen führend im Bereich der diversifizierten Entsorgung. GFL Environmental provides environmental services and is growing all the time. It was founded by Canadian entrepreneur Patrick Dovigi in 2007 and now employs over 5,000 people. Today, the company offers services locally for over two and a half million households and around 80,000 industrial customers. In North America its light-green trucks are well known in the urban area and it’s a leader in diversified waste disposal solutions. GFL’s holistic approach in wanting to boost society’s responsibility for the environment and make its customers and employees Green for Life is expressed in the choice of furniture for the organisation’s branches too. GFL has been choosing Wilkhahn’s ON since 2015; in terms of providing healthy stimuli to move and environmental friendliness, the chair’s a frontrunner. Known for his exquisite taste and desire for top quality, company founder Patrick Dovigi admits he’s a dyed-in-the-wool Wilkhahn fan: “Once we’d decided on a site, we had to select a chair for all our employees. The ON chair easily beat the competition. It will also be our standard chair for all branches in the future.” We’re delighted with this compliment and look forward to working with the Canadian company in the future. Toronto’s plan b dealer focuses on office interiors and has a good selection of contemporary and timeless designer furniture.